HDAC Assay Kits are 96-well plate-based assays to determine the HDAC (Histone Deacetylase) activity in your extracts or purified samples. HDAC Assay Kits are available in both colorimetric and fluorescent formats to suit your needs. Each HDAC Assay Kit contains positive control HeLa nuclear extract, deacetylated HDAC assay standard, HDAC peptide substrate, Trichostatin A as a model inhibitor and all the essential buffers for a full 96-well plate assay. Figure 1: Colorimetric HDAC Assay results. HeLa nuclear extracts were assayed from 0 to 50 µg per well in duplicate. The purple line represents activity from untreated extracts, while the copper line represents extracts treated with 1 µM Trichostatin A inhibitor. Figure 2: Fluorescent HDAC Assay results. 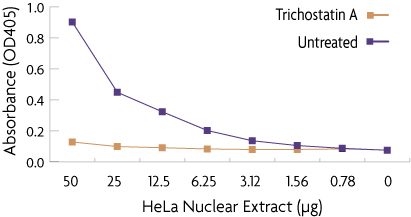 HeLa nuclear extracts were assayed from 0 to 10 µg per well in duplicate. The purple line represents activity from untreated extracts, while the copper line represents extracts treated with 1 µM Trichostatin A inhibitor.